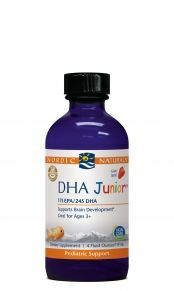 DHA Junior by Nordic Naturals is the perfect Omega-3 dietary supplement for children three years of age and up. Now available in this convenient economy size, DHA Junior chewable softgels come in a delectible natural strawberry flavor kids love! DHA supports the continual development of young brains and minds and also provides nutrients for healthy eyes. 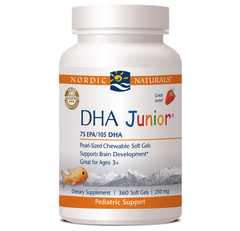 DHA Junior also contains naturally-occurring vitamins A and D from purified arctic cod liver oil. 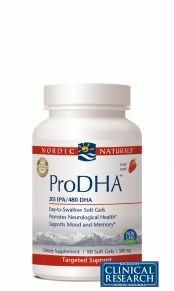 DHA has also been found to provide nutritional support for the nervous system, and is believed to help decrease hyperactivity in children, even those with ADD and ADHD. DHA Junior contains rosemary extract so it is gentle on your childs stomach. 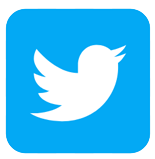 Suggested Use: Four softgels daily with food, or as directed by your healthcare professional. 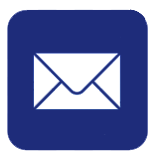 Softgels can be chewed or swallowed. Use only for children 3 years old and over. Serving Size: 4 Softgels daily, with food. 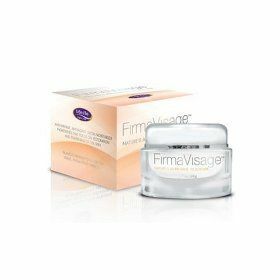 Other Ingredients: Purified arctic cod liver oil, soft gel (gelatin, water, glycerin, xylitol, natural strawberry flavor, beeswax), d-alpha tocopherol, natural strawberry flavor, rosemary extract ( a natural preservative). 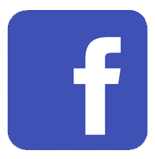 Contains no gluten, milk derivatives, or artificial colors or flavors. 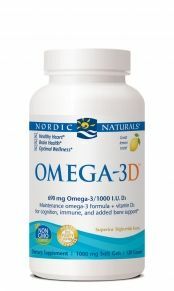 Love this product (as well as others by Nordic Naturals!)... Children almost consider it candy, and always remind me to give it to them if I forget. Prescribed by our chiropractor.